Cities: Capital: no official capital; government offices in Yaren District. Terrain: Rough beach rises to a fertile but narrow ring around a raised, prehistoric coral reef plateau, studded with coral pinnacles exposed by phosphate mining. Climate: Equatorial; monsoonal; rainy season (November to February); unreliable rainfall and prone to El Nino-linked droughts. Nationality: Noun and adjective: Nauruan(s). Age structure (2011 est. ): 35.4% under 15; 2.9% over 60. Annual population growth rate (2011 est. ): 2.1%. Ethnic groups: Nauruan 93%, Chinese 5%, other Pacific Islander 1%, European 1%. Religions: Christian (two-thirds Protestant, one-third Roman Catholic). Health (2006): Life expectancy: women 57.1 years; men 55.2 years. Infant mortality rate — 45.8/1,000. Work force (2006): Labor force participation rate was 78.7%; 2,081 were wage earners and 0.8% were subsistence workers. Branches: Executive: president and cabinet. Legislative — unicameral Parliament. Judicial — Supreme Court, District Court, and Family Court. Political party: Naoero Amo (Nauru First) Party. Central government budget (2006-2007): $18.9 million. Suffrage: Universal at age 20. Per capita GDP (2009 est. ): $5,551. Avg. inflation rate (2009 est. ): 2.2%. Trade: Exports (2009): $100.2 million: phosphates. Major export markets — South Korea, India, New Zealand, Australia, Indonesia, United States. Imports (2009) — $145.1 million: food, fuel, manufactures. Major import sources — Russia, Australia, South Korea, United States, Germany, Japan. Nauru is a small oval-shaped island in the western Pacific Ocean, located just 42 kilometers (26 mi.) south of the Equator. It is one of three great phosphate rock islands in the Pacific Ocean — the others are Banaba (Ocean Island) in Kiribati and Makatea in French Polynesia. Until recently Nauru's phosphate reserves were thought to be nearly depleted, but there are some indications that the potential for continued productive mining might exist. Phosphate mining in the central plateau has left a barren terrain of jagged, prehistoric coral pinnacles, up to 15 meters (49 ft.) high. A century of mining has stripped and devastated four-fifths of the total land area. Efforts to rehabilitate the mined-out areas have been unsuccessful. The island is surrounded by a coral reef, exposed at low tide and dotted with pinnacles. The reef is bounded seaward by deep water, inside by a narrow sandy beach. A 150-300-meter (492-984 ft.) wide fertile coastal strip lies landward from the coast, ending in forested coral cliffs that rise to the now mined-out central plateau. The highest point of the plateau is 65 meters (213 ft.) above sea level. The island's only fertile areas are within the narrow coastal belt, where there are coconut palms, pandanus trees, and indigenous hardwoods, and the land surrounding the inland Buada lagoon on the central plateau, where bananas, pineapples, and some vegetables are grown. Some secondary vegetation has begun to cover the scarred central plateau and its coral pinnacles. 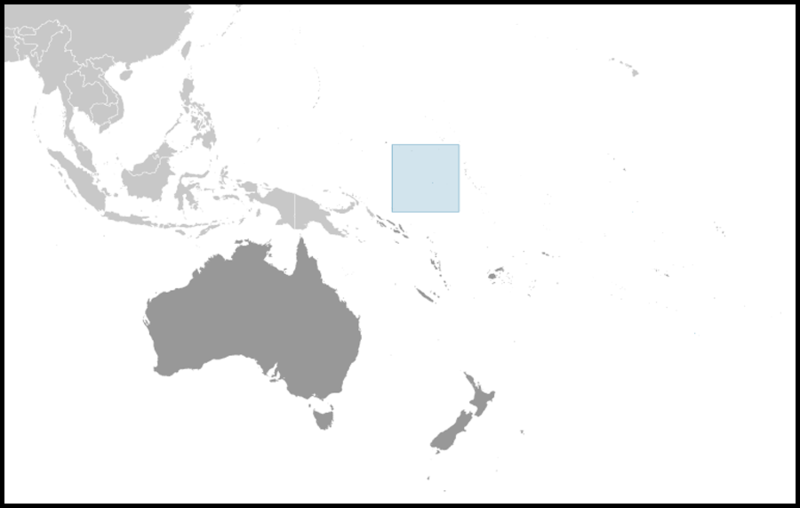 Nauruans descend from Polynesian and Micronesian seafarers. Grouped in clans or tribes, early Nauruans traced their descent on the female side. They believed in a female deity, Eijebong, and a spirit land, also an island, called Buitani. Two of the 12 original tribal groups became extinct during the 20th century. Because of poor diet, alcohol abuse, and a sedentary lifestyle, Nauru has one of the world's highest levels of diabetes, renal failure, and heart disease, exceeding 40% of the population. Nauru had little contact with Europeans until whaling ships and other traders began to visit in the 1830s. The introduction of firearms and alcohol destroyed the peaceful coexistence of the 12 tribes living on the island. A 10-year internal war began in 1878 and resulted in a reduction of the population from 1,400 (1843) to around 900 (1888). The island was allocated to Germany under the 1886 Anglo-German Convention. Phosphate was discovered a decade later and the Pacific Phosphate Company started to exploit the reserves in 1906, by agreement with Germany. Following the outbreak of World War I, Australian forces captured the island in 1914. After the war, the League of Nations assigned a joint trustee mandate over the island to Britain, Australia, and New Zealand. The three governments established the British Phosphate Commissioners, who exercised the rights to phosphate mining. During World War II Japan occupied Nauru from August 1942 until the end of the war and deported 1,200 Nauruans to work as laborers in the Caroline Islands, where 463 died. The survivors returned to Nauru in January 1946. After the war the island became a UN Trust Territory under Australia, in line with the previous League of Nations mandate, and it remained one until it became an independent republic in 1968. A plan by the partner governments to resettle the Nauruans (due to dwindling phosphate reserves and damage to the island from extensive mining) on Curtis Island off the north coast of Queensland, Australia, was abandoned in 1964 when the islanders decided not to move. 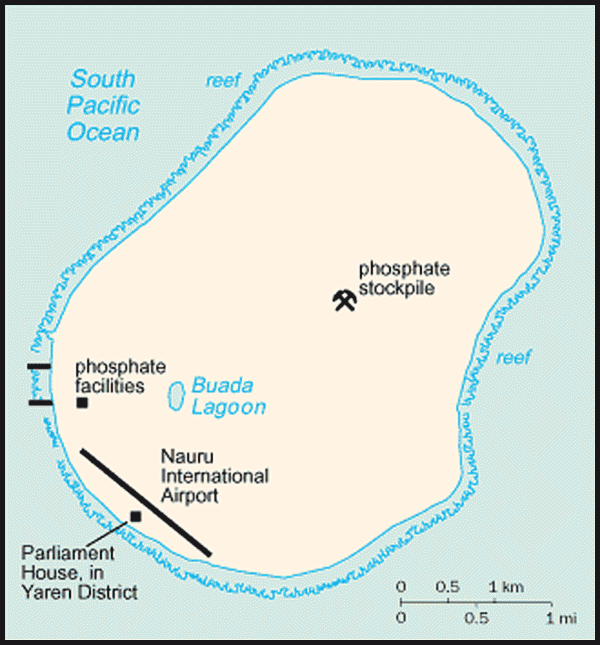 In 1967, the Nauruans purchased the assets of the British Phosphate Commissioners, and in June 1970 control passed to the Nauru Phosphate Corporation. In 1989 Nauru filed suit against Australia in the International Court of Justice in The Hague for damages caused by mining while the island was under Australian jurisdiction. Australia settled the case out of court in 1993, agreeing to pay a lump sum settlement of A$107 million (U.S. $85.6 million) and an annual stipend of the equivalent of A$2.5 million in 1993 dollars toward environmental rehabilitation. The country is governed by a unicameral Parliament consisting of 18 members elected at least triennially from 8 constituencies. Parliament elects the president, who is both chief of state and head of government, from among its members. The president appoints a cabinet from among members of Parliament. For its size, Nauru has a complex legal system. The Supreme Court, headed by the Chief Justice of Nauru, is paramount on constitutional issues, but other cases can be appealed to the two-judge Appellate Court. Parliament cannot overturn court decisions, but Appellate Court rulings can be appealed to Australia's High Court; in practice, however, this rarely happens. Lower courts consist of the District Court and the Family Court, both of which are headed by a Resident Magistrate, who also is the Registrar of the Supreme Court. Finally, there also are two quasi-courts — the Public Service Appeal Board and the Police Service Board — both of which are presided over by the Chief Justice. There is a small police force under civilian control. There are no armed forces. Nauru does not currently have an embassy in the United States but does have a UN Mission at 800 2nd Ave, Suite 400D, New York, New York 10017 (tel: 212-937-0074, fax: 212-937-0079). In recent decades, amid growing turmoil over Nauru's uncertain future and economic failures, no-confidence votes that spurred changes of government became commonplace. The first several months of 2010 saw a political standoff between the government and opposition in Parliament and a number of efforts to resolve the stalemate. A constitutional referendum that proposed, inter alia, to introduce measures to ensure the stability of government failed to pass in February. After overcoming another in a series of no-confidence votes, the government in March called a snap election, which was held in April. The April elections returned the same parliamentarians; after weeks of negotiations, they elected a speaker who then resigned after a few days in office, leaving Parliament unable to elect a president. By June 2010 Parliament remained in a stalemate, and caretaker President Marcus Stephen invoked a state of emergency, dissolved Parliament, and called a second election, which was held in late June. The June elections returned the same parliamentarians except for one, and the political standoff continued in the following weeks with Parliament still unable to elect a president. In July, President Stephen extended the state of emergency and adjourned Parliament until further notice. The stalemate ended in November 2010 with the election of opposition member and former president Ludwig Scotty as Speaker of the House. The state of emergency was lifted after Marcus Stephen was reelected President, defeating opposition member Milton Dube. Having once boasted the second-highest per capita GDP in the world thanks to its fabled phosphate mines, Nauru is today destitute. With the seeming depletion of readily accessible phosphate reserves in 2000, mining on a large-scale commercial basis ended. The decline of mining saw a dramatic economic contraction, compounded by past government corruption and disastrous mismanagement of trust funds that had been expected to provide post-mining revenue streams for Nauru's citizens. Since 2000, Nauru has relied largely on payments for fishing rights within its exclusive economic zone, earnings from hosting two Australian refugee processing camps, and massive injections of grants and development funding, principally from Australia, New Zealand, Japan, China, and more recently Taiwan. The government-owned mining company, the Republic of Nauru Phosphate Company, or RONPhos, has resumed mining and exporting phosphate and has reportedly made a small profit. Nauru has a nominal per capita GDP of $5,551. The resumption of mining promises a limited respite as the country seeks to find a sustainable economic future. The private sector is very small and employs fewer than 300. Nauru imports well over 90% of its foodstuffs and other basic goods, but sea and air transport has become problematic. In December 2005, the national airline's remaining airplane was repossessed for non-payment, leaving Nauru dependent on chartered flights. In September 2006, with financing help from Taiwan, a replacement aircraft re-established scheduled commercial flights to Nauru and around the region under the new name of Our Airline. The provision of electricity and water, both dependent on expensive imported fuel, is limited and sporadic. With the help of the Pacific Islands Forum and numerous development partner nations, Nauru completed in 2009 a major, multi-year strategic national development program to enable it recover from a crisis of failing finances and insurmountable debts. The program has also helped Nauru develop a sustainable economic framework for the country. Following independence in 1968, Nauru joined the Commonwealth as a Special Member. Special Members take part in all Commonwealth activities except heads of government meetings. They are not assessed but make voluntary contributions toward the running of the Secretariat. They are eligible for all forms of technical assistance. Nauru was admitted to the United Nations in 1999. It is a member of the Pacific Islands Forum, the South Pacific Regional Environmental Program, and the Secretariat of the Pacific Community. In 2001 at Australia's request, Nauru became host to approximately 1,200 asylum seekers, mostly Afghan, who were intercepted while attempting to enter Australia illegally. By mid-2006, only a single Iraqi refugee remained on the island. In September 2006, Australia effectively re-opened the center by transferring seven Burmese asylum seekers there for assessment. In March 2007, Australia transferred 82 Sri Lankan refugees to Nauru. 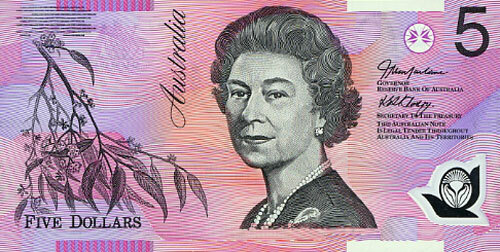 In exchange for housing the refugees, Australia provided Nauru with extensive grants and aid. However, in February 2008, the Australian Government closed the detention center in Nauru and the remaining 21 Sri Lankan asylum seekers were transferred to Australia. During 2002 Nauru severed diplomatic recognition with Taiwan and signed an agreement to establish diplomatic relations with the People's Republic of China. This move followed China's promise to provide more than U.S. $130 million in aid. In May 2005, Nauru re-established diplomatic ties with Taiwan, ending its relationship with China. Taiwan and Australia have the only diplomatic missions on Nauru. 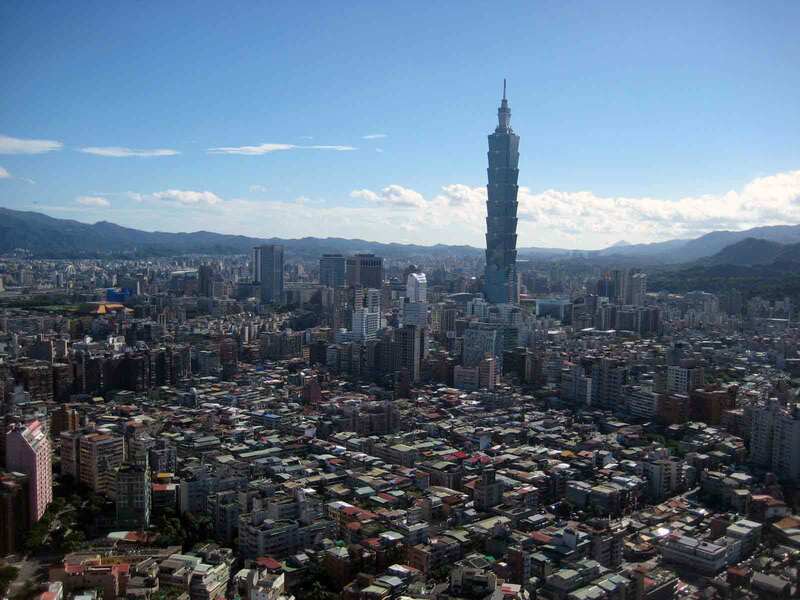 In March 2007, Nauru established an embassy in Taipei. Relations between the United States and Nauru are cordial. The U.S. has no consular or diplomatic offices in Nauru. Officers of the American Embassy in Suva, Fiji, are concurrently accredited to Nauru and make periodic visits. Trade between the United States and Nauru is limited by the latter's small size, remoteness, and economic problems. The value of two-way trade in 2010 was $2.711 million. The U.S. Embassy (http://suva.usembassy.gov/) at Suva, Fiji, also accredited to Nauru, is located at 158 Princes Road, Tamavua, Suva (tel: 679-331-4466; fax 679-330-2267). The mailing address is U.S. Embassy, P.O. Box 218, Suva, Fiji.